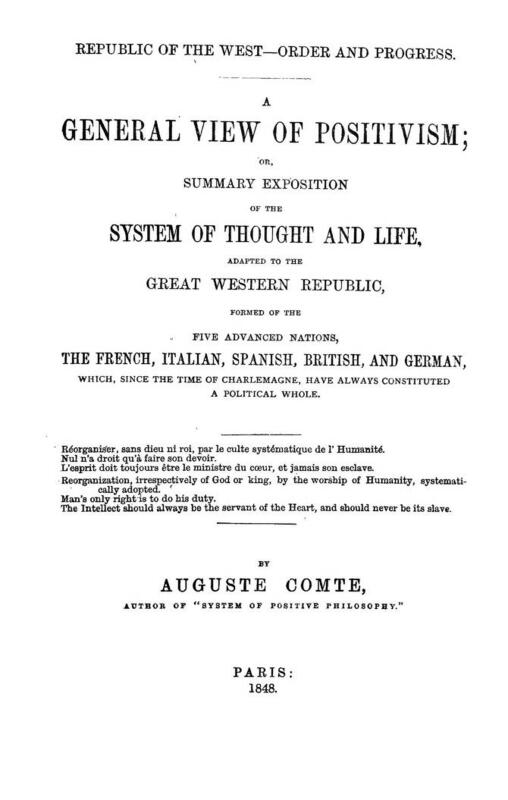 From the “introductory remarks” to Auguste Comte, A General View of Positivism [French 1848], Bridges, J.H. (tr.) (London: Trubner and Co., 1865/ 2nd ed. 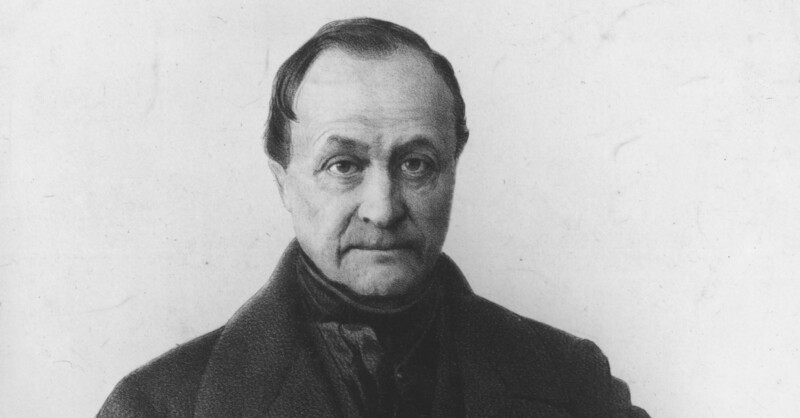 1880), pp. 1-5. Reissued by Cambridge University Press, 2009; ISBN 978-1-108-00064-2. Positivism consists essentially of a Philosophy and a Polity. These can never be dissevered; the former being the basis, and the latter the end of one comprehensive system, in which our intellectual faculties and our social sympathies are brought into close correlation with each other. For, in the first place, the science of Society, besides being more important than any other, supplies the only logical and scientific link by which all our varied observations of phenomena can be brought into one consistent whole. Of this science it is even more true than of any of the preceding sciences, that its real character cannot be understood without explaining its exact relation in all general features with the art corresponding to it. Now here we find a coincidence which is assuredly not fortuitous. At the very time when the theory of society is being laid down, an immense sphere is opened for the application of that theory; the direction, namely, of the social regeneration of Western Europe. For, if we take another point of view, and look at the great crisis of modern history, as its character is displayed in the natural course of events, it becomes every day more evident how hopeless is the task of reconstructing political institutions without the previous remodelling of opinion and of life. To form then a satisfactory synthesis of all human conceptions is the most urgent of our social wants: and it is needed equally for the sake of Order and of Progress. During the gradual accomplishment of this great philosophical work, a new moral power will arise spontaneously throughout the West, which, as its influence increases, will lay down a definite basis for the reorganization of society. It will offer a general system of education for the adoption of all civilized nations, and by this means will supply in every department of public and private life fixed principles of judgment and of conduct. Thus the intellectual movement and the social crisis will be brought continually into close connexion with each other. Both will combine to prepare the advanced portion of humanity for the acceptance of a true spiritual power, a power more coherent, as well as more progressive, than the noble but premature attempt of mediaeval Catholicism. The primary object, then, of Positivism is twofold: to generalize our scientific conceptions, and to systematize the art of social life. These are but two aspects of one and the same problem. […] The regenerating doctrine cannot do its work without adherents; in what quarter should we hope to find them? Now, with individual exceptions of great value, we cannot expect the adhesion of any of the upper classes in society. They are all more or less under the influence of baseless metaphysical theories, and of aristocratic self-seeking. They are absorbed in blind political agitation and in disputes for the possession of the useless remnants of the old theological and military system. Their action only tends to prolong the revolutionary state indefinitely, and can never result in true social renovation. Whether we regard its intellectual character or its social objects, it is certain that Positivism must look elsewhere for support. It will find a welcome in those classes only whose good sense has beenleft unimpaired by our vicious system of education, and whose generous sympathies are allowed to develop themselves freely. It is among women, therefore, and among the working classes that the heartiest supporters of the new doctrine will be found. it is intended, indeed, ultimately for all classes of society. But it will never gain much real influence over the higher ranks till it is forced upon their notice by these powerful patrons. When the work of spiritual reorganization is completed, it is on them that its maintenance will principally depend; and so too, their combined aid is necessary for its commencement. Having but little influence in political government, they are the more likely to appreciate the need of a moral government, the special object of which it will be to protect them against the oppressive action of the temporal power. Thus it is that a philosophy originating in speculations of the most abstract character, is found applicable not merely to every department of practical life, but also to the sphere of our moral nature. But to complete the proof of its universality I have still to speak of another very essential feature. I shall show, in spite of prejudices which exist very naturally on this point, that Positivism is eminently calculated to call the Imaginative faculties into exercise. It is by these faculties that the unity of human nature is most distinctly represented: they are themselves intellectual, but their field lies principally in our moral nature, and the result of their operation is to influence the active powers. […] I shall attempt to show that the new doctrine by the very fact of embracing the whole range of human relations in the spirit of reality, discloses the true theory of Art, which has hitherto been so great a deficiency in our speculative conceptions. The principle of the theory is that, in coordinating the primary functions of Humanity, Positivism places the Idealities of the poet midway between the Ideas of the philosopher and the Realities of the statesman. We see from this theory how it is that the poetical power of Positivism cannot be manifested at present. We must wait until moral and mental regeneration has advanced far enough to awaken the sympathies which naturally belong to it, and on which Art in its renewed state must depend for the future. The first mental and social shock once passed, Poetry will at last take her proper rank. She will lead Humanity onward towards a future which is now no longer vague and visionary, while at the same time she enables us to pay due honour to all phases of the past. The great object which Positivism sets before us individually and socially, is the endeavour to become more perfect. The highest importance is attached therefore to the imaginative faculties, because in every sphere with which they deal they stimulate the sense of perfection. Limited as my explanations in this work must be, I shall be able to show that Positivism, while opening out a new and wide field for art, supplies in the same spontaneous way new means of expression. I shall thus have sketched with some detail the true character of the regenerating doctrine. All its principal aspects will have been considered. Beginning with its philosophical basis, I pass by natural transitions to its political purpose; thence to its action upon the people ‘ Its influence with women, and lastly, to its esthetic power. 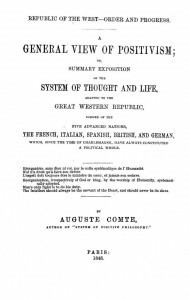 In concluding this work, which is but the introduction to a larger treatise, I have only to speak of the conception which unites all these various aspects. As summed up in the positivist motto, Love, Order, Progress, they lead us to the conception of Humanity, which implicitly involves and gives new force to each of them. Rightly interpreting this conception, we view Positivism at last as a complete and consistent whole. The subject will naturally lead us to speak in general terms of the future progress of social regeneration, as far as the history of the past enables us to foresee it. The movement originates in France, and is limited at first to the great family of Western nations. I shall show that it will afterwards extend, in accordance with definite laws, to the rest of the white race, and finally to the other two great races of man.